I managed to complete one more little project before Christmas. I was hoping to have the time to do it but wasn't confident that I would. 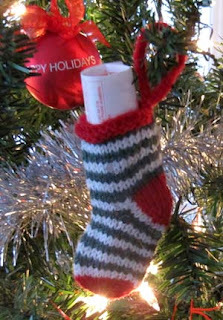 The details for this mini-stocking is the same as one I did earlier for my Mom, click here. This one was hung on my daughter and son-in-law's tree and there is a (hopefully winning) lottery ticket in it. I just realized, after posting about this stocking, that I forgot to sew the decorative little button at the base of the hanger. I'll add it later on.